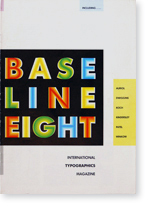 In this edition of Baseline we are taking a look at the people behind the faces. 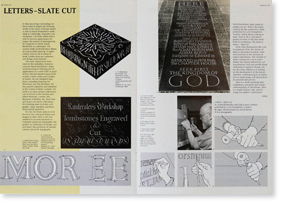 As a counter-balance to the technical detail of type technology Baseline 8 adopts the theme of the importance of individual designers and craftsmen using their inventiveness and labour to create some new valuables for our typographic strong-room. So ideas become projects and projects become typefaces, or companies, or even whole movements, like Art Nouveau. 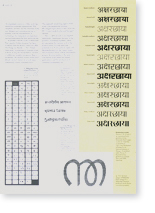 I am sure that by examining the efforts of others and showing them today’s designers Baseline plays a part in helping us to strive to maintain high typographic standards, which are of more importance now, in our world of mass communications than they have ever been. 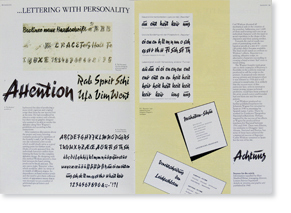 Scripts, when appearing in typesetting systems have always held particular fascination. 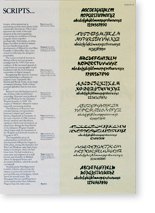 Often, they represent the work of the type designer at his most ingenious, overcoming the problems of fitting irregular forms together mechanically. Sometimes, as when Roger Excoffon worked to imitate his own handwriting in the development of Mistral for the Olive Foundry in Marseilles, they come closest to reflecting the designer’s personality. 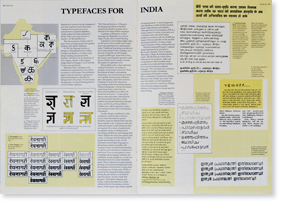 Baseline has looked at the development of non-latin typefaces in previous issues. Yasaburo Kuwayama gave us an introduction to Japanese alphabets, Arabic scripts have been analysed by Walter Tracy and, most recently in Baseline 7, by Mourad Boutros.